We create communication concepts for events and media. By specialising on the sectors of creative arts and sports we gained a very deep insight in experience based communication. As a result of this developing individual solutions in-house within our team of experts offers a high range of production ideas for almost every case. We love the effect of creative arts. 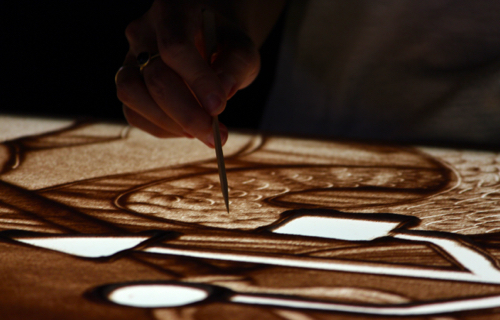 Sandart as one of our specialist subjects is a perfect tool to bring ideas and people together. This kind of visual art arouses emotions in a matter of seconds and open the doors for innovative storytelling ideas in the area of B2C and B2B communications. 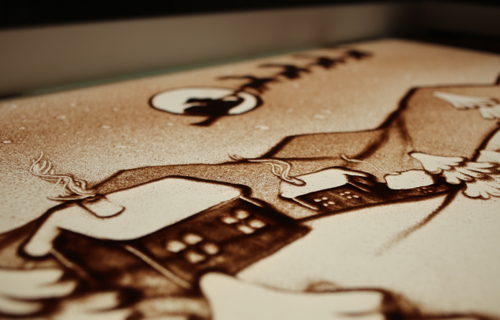 We have produced a sandart video for Liebherr International as part of their Christmas campaign in 2015. On the base of a multi-cam setup we wanted to create a more intensive experience for the viewers. This technical idea of producing sand videos offers us the opportunity to achieve a high quality of presentation. 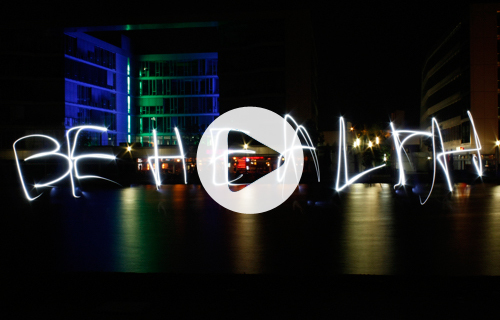 Individuality in storytelling, artistic talent and a professional video production led to an exciting sandart video. 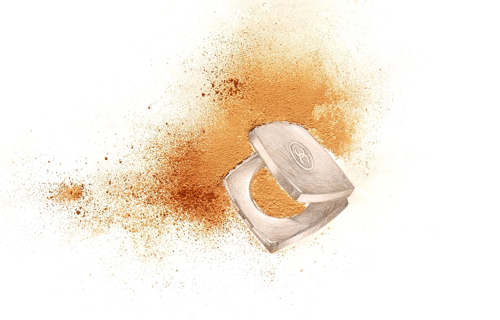 Creating images with sand, sugar, flour, flakes or other particles like cosmetic powder is possible. We can realize every idea with a tremendous experience value. 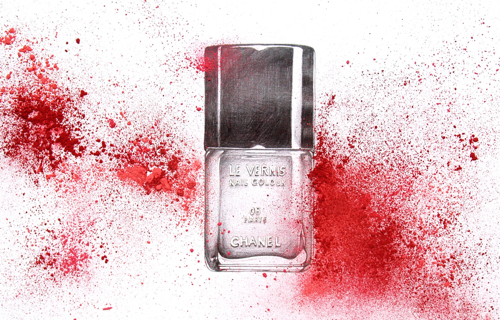 Some years ago our sand artist and illustrator Vernessa has prepared some images combining pencil drawings with colourful cosmetic powder for an internal presentation by Chanel Germany. Performing sandart shows live at events is our passion. 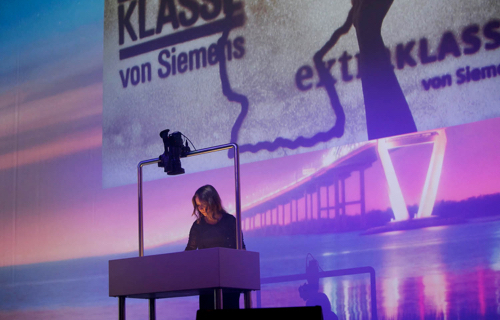 In this special case, an event by Siemens, our sand artist Maja performed a sandshow presenting the past 25 years of Siemens Extraklasse. Maja was part of an event with VIPs, stars and astonishing live acts. Our sand artist Maja performed a sandshow as opening act for the Metallbaukongress as well as introduction for the following presentation of our client TENADO. 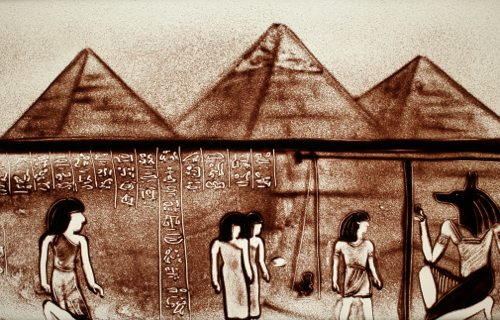 Maja presented a sandart experience with a historical review in technical drawing. It was one of those outisde the box experiences we have created for this project. Our sand artist Vernessa was part of the opening ceremony for ANVIS's new office department in Germany. 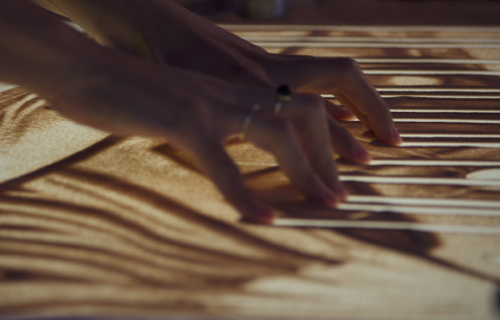 Performing with sand always means emotionalizing the audience. In this constellation we ensure that everything within this unique live show will be as fine as possible, in order to create a high-class moment for everybody. Sandart is real passion, thus each sandshow has to be extraordinary. On the occasion of Wendt&Kühn’s anniversary event at the Albertinum in Dresden, our sand artist Vernessa has created a very emotional and customer-based sandshow. With this live performance Vernessa opened the doors for the sandart lounge where the participants got the chance to try sandpainting on their own or under the guidance of her as a professional sand artist. Furnitures for sandart lounges are part of our rental equipment and be booked additionally depending on the real needs within locations. Working with powder in order to create images innovatively is very exciting. It’s more a process of scattering and laying than painting until the final image is ready to be photographed. However, we call this way of image production painting as the images still create the impression of paintings. For a very special request by Galileo, a popular-science magazine in the German television, we organised an in-house production. Our sand artist Vernessa as well as the production company Bilderfest realized two TV spots within one day. Vernessa set the origin of modern but everyday signs into highlight by painting effective sand images. Sandart videos offer such a wide range of production ideas. Safi International for example, a Norwegian initiative producing clean cookstoves for the African Market has produced a sandart video together with us in order to emotionalize viewers, customers and partners. Sandart videos are perfect for social media and POS as the customer will stop to watch the story. Sport is our passion, we really live for it. Especially trend sports are in our focus. Infinite opportunities and this kind of enthusiasm between athletes and audience make this dynamical area of operation extremely exciting. shred the deck is a creative project we have launched in 2012 in order to create a unique lifetime experience with young people. We thought about a project bringing their passion for wakeboarding and our opportunities in producing event and media solutions together. Acting within a sustainable landscape is a gift. 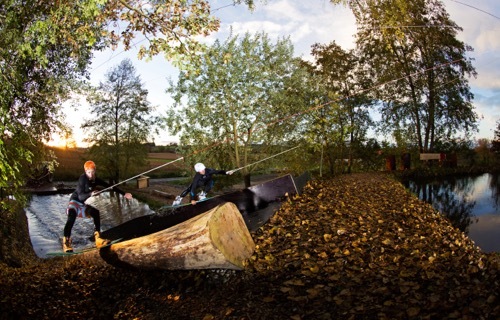 The unique scenery around our wakepark inspires us as it still offers so much more ideas to be realized. We have worked out varied concepts in terms of art, sports and culture - concepts for respectful projects. The idea of shred the deck was born very fast and took place at one of our rider’s private homespot in Bavaria. 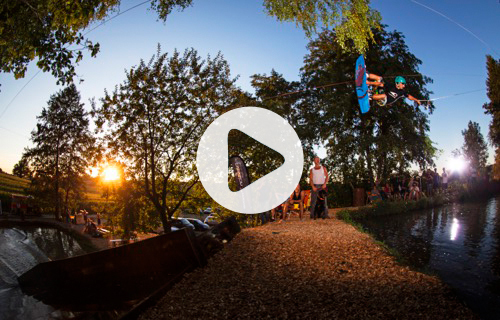 Altogether, the riders, their enthusiasm, the local spectators and the spirit of this unique and historical location made shred the deck so fantastic. Riding for us isn't a question of feeling comfortable, it's more like stepping out of a wakeboarder's comfort zone in order to discover the unknown. Working at the wakepark isn’t always fun but riding the first line lets you forget everything and fullfills you with complete satisfaction. Pushing the limits for a common goal is the driving force of our team. We came together during all seasons of the year. In spring everything was refreshing and inspiring, in summer we also met for midnight BBQs with friends, in autumn we shredded fallen leaves and in winter we crushed ice floes. 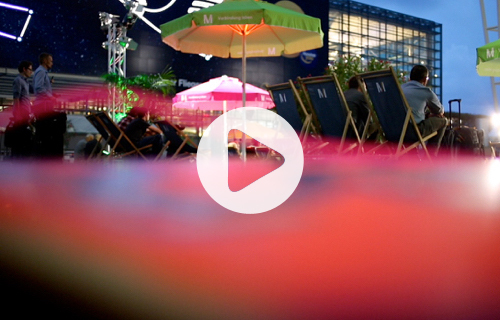 From secret team sessions to a highlight event with up to 1.000 visitors we had a lot of action at our location. We tried to take the best out of the spot. Shredding our main obstacle upward from a lower pool into a 4 meters higher levelled natural pond was a blast. After several sessions we finally changed the direction and went down. 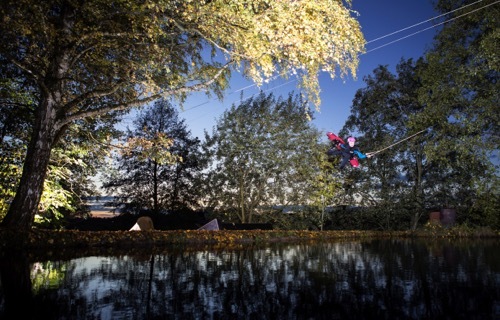 The idea of going deep led to a completely new experience for all of us - action, risk, airtime, fun and great personal stories. Probably the most impressive sessions took place at night. Going into a dark forest for a shred isn't exactly what young people are expected to do in their spare time. Riders, friends and people from the neighbourhood came together to become part of these very magic moments. 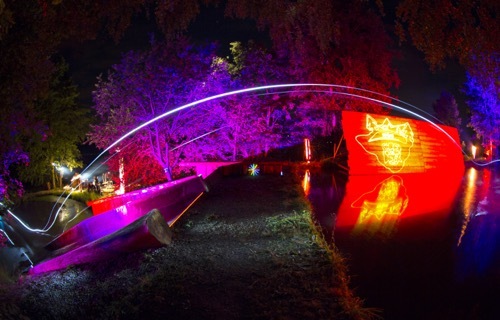 Illuminating this natural spot with coloured floodlights transformed the whole scenery into an experimental landscape. Riding without light into pure darkness was another exciting moment, for the rider as well as for the photographer. Mutual trust, professionalism and a clear vision led us to the perfect shot within a midnight shred. Moments like these are a symbol for the possibilities within a team of experts. Creating ideas and putting them directly into practice is one of our strengths. We all know now, action follows passion. Going deep was an experience for our team as none of us knew if this idea would work. After a few drops of courage and some trials we were sure it was worth doing it. The image output from the photo shoot was awesome, a real reward for all the effort. Riding a double line at our flexible winch operated system led to further impacts. The riders had the chance to share their passion for wakeboarding with each other. None of them will ever forget the feeling shredding side by side along this massive obstacle to end up with a tandem role beyond the gap. shred the deck has to offer so much more. 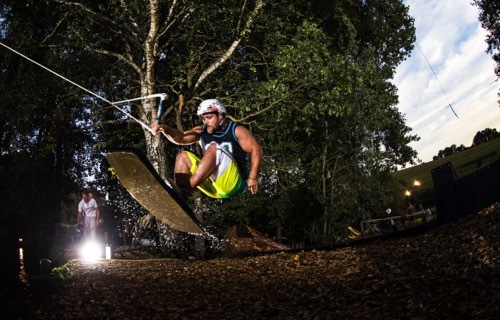 Let’s hope we will return one day to launch further new ideas in wakeboarding. 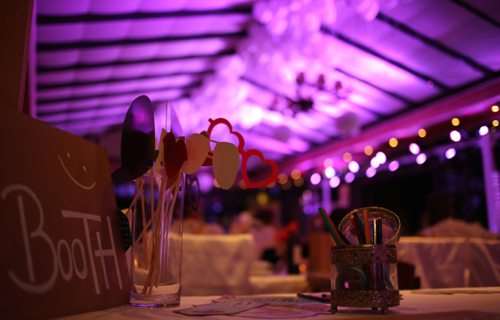 Events are spectacular and create a fascinating impression on your clients. The long way from the initial idea to a flawless execution requires a thorough and structured planning. We have been commissioned to realize a very memorable gala event for the MORABA symposium in 2015. 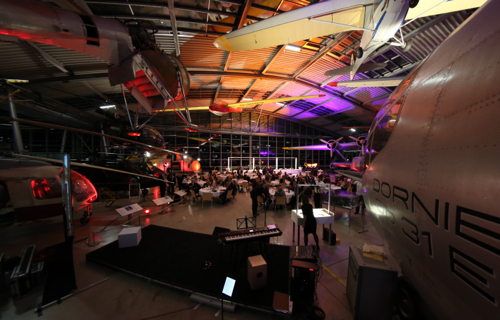 As the MORABA is a specialized division of the DLR "Deutsche Luft- und Raumfahrt" we have arranged an event experience at the aviation museum in Munich. On the base of this entertainment and dining concept our sand artist Maja performed a live sandshow representing the most exciting moments within the MORABA team during the past years. Thus, Maja led the audience through a story of international rocket launching sites, unique team adventures and individual personal highlights. This annual event representing the cultural and economical connections between Bavaria and China takes place in Munich since 2012. The "Chinaforum Bayern“ as the organizer of this event has the goal to create a memorable and exciting festival defined by Bavarian tradition and Chinese culture. The whole event is designed as a mix of art exhibition, discussion forum, presentation, live communication and country-specific dining. Since we are involved in the project development, we take this event as a chance to launch new ideas for the Bavarian Chinese Spring Festival. We have created an event solution to let a one of a kind event concept from one of our clients become real. 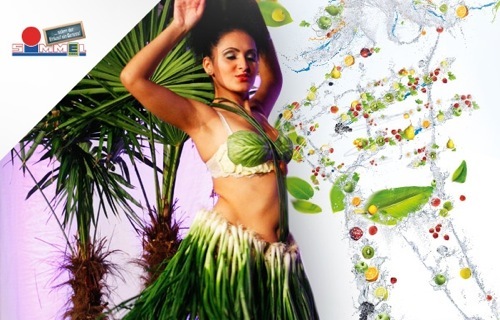 The main idea was to realize a fashion show inside a supermarket, represented by fruits and performed by daily clients. The event was cause for different communication solutions and media productions we have produced in this constellation. We make dreams real, always on the base of our customers’ needs. Designing wedding locations elegantly and effectively is our ambition. 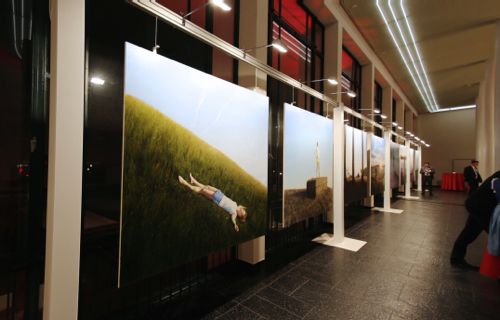 With our gallery system we are able to hide technical installation in order to create perfect atmospheric sceneries. 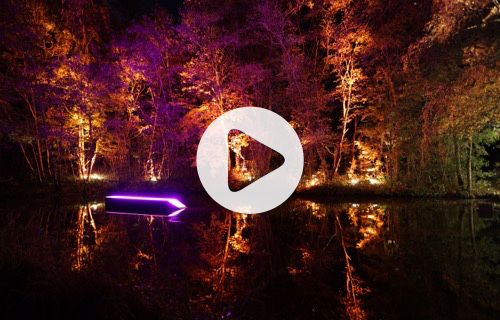 On the one hand we are specialized in illuminating wedding locations but on the other hand we offer a couple of additional services like audio, video and staging technics, lounge furnitures, special decorative articles and live-acts. Our team will be pleased to advise you on individually tailored solutions. The CaratArt event at the Carat hotel in Munich was a great experience for all visitors. 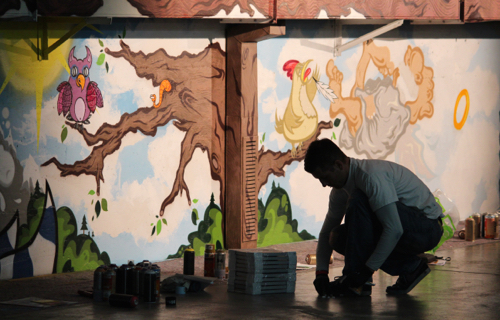 People got in touch with art, watched the artists at work and talked to them in a cosy atmosphere. Apart from these artistic adventures the event offered some more entertainment features like a live entertainment installation in the windows of the hotel. All in all a nice event with a lot of experience values. The significance of strategical means regarding communication for brands and products is still rising. We constantly match our services to the current market standards and go for innovative media concepts. Having been part of this project is very important to us as it deals with important issues of this life. Spreading health awareness is the mission of this association. Running projects in Bangkok and Djibouti are already established. In collaboration with Kempinski, one of BE’s founding members, and great people we have produced an image video for BE HEALTH ASSOCIATION giving anybody an insight in this project. Surfing at Munich Airport is really passionate, what an amazing sports event concept. We had the pleasure of being there to catch the feeling of the surfer’s lifestyle and their passion for this sport within this unique location between terminal 1 and 2. This video is a short event clip about the European Championship in stationary wave riding. Enjoy it and have fun. 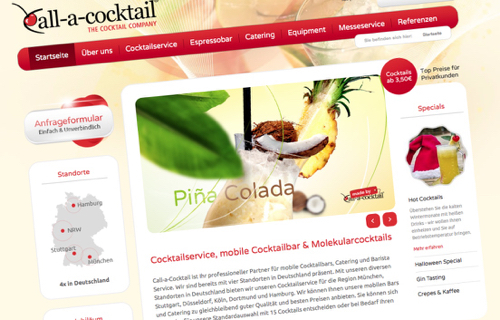 On the base of a comprehensive relaunch we have developed a new corporate design for our client Call-a-Cocktail. The production included a website design, a relevant product shooting, the necessary text creation as well as the production of advertising media. Our expertise in events and the related understanding of customary processes have been the decisive aspect for working on this project. The communication strategy could have been designed very dynamical and intuitive, in the interest of the client. A creative highlight moment within the Surf&Style 2016 was a night session at the beginning of the event. Local riders from Munich were invited to surf in a unique scenery at Munich Airport. Professional fog machines, moving lights, blinders and are coloured spotlights made this session so unbelievably crazy. We hope the video conveys the impression of how genious surfing was that night. 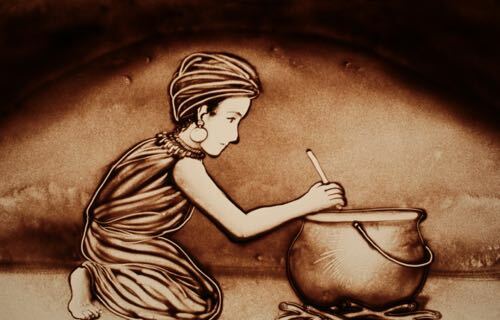 This video shows one day in Vernessa's working life, defined by illustrating and sand painting. 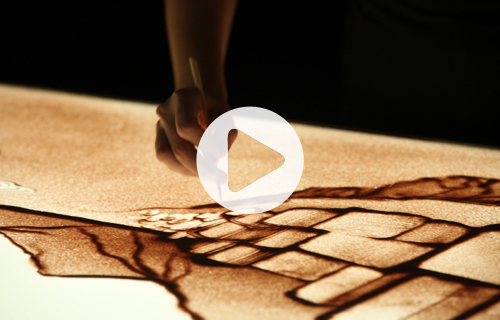 Vernessa is one of our professional German sand artists based in Hamburg. In collaboration with us Vernessa creates unique sandart performances for gala events, trade fairs, fashion shows and other public events. All sandshows are concepted on base of the customers' needs in order to create a maximum target-group specific involvement of viewers and participants. Enjoy this very personal insight in Vernessa’s daily routine. This website design project was a very creative one. 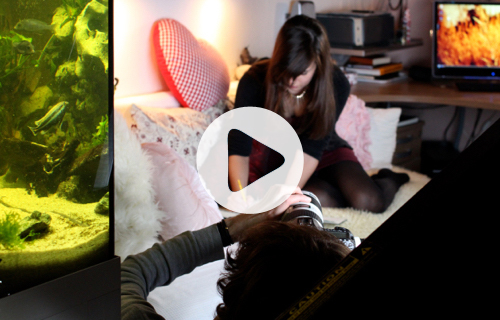 On the base of shooting clean and effective photos we concentrated on a minimum of content flow. 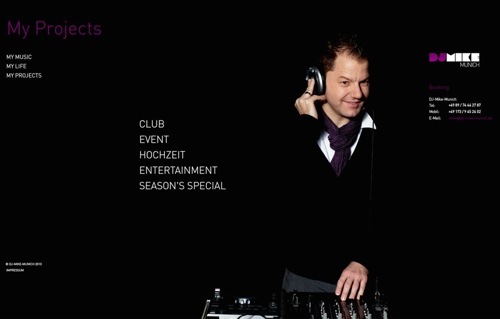 The presentation of a DJ needs a high usability with a clear mission - getting interested in this artist. 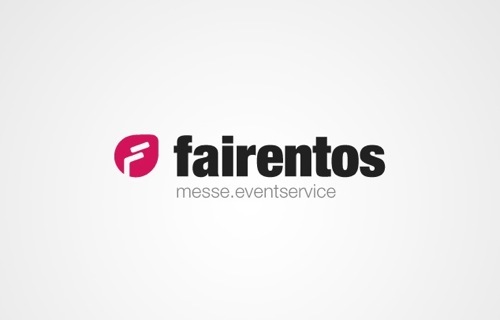 As fairentos is a by-product of Call-a-Cocktail we have complemented our service by developing another web design. On the one hand the concept was very similar but on the other hand we had the task to give this brand a unique character as fairentos should be established in a different field of action.